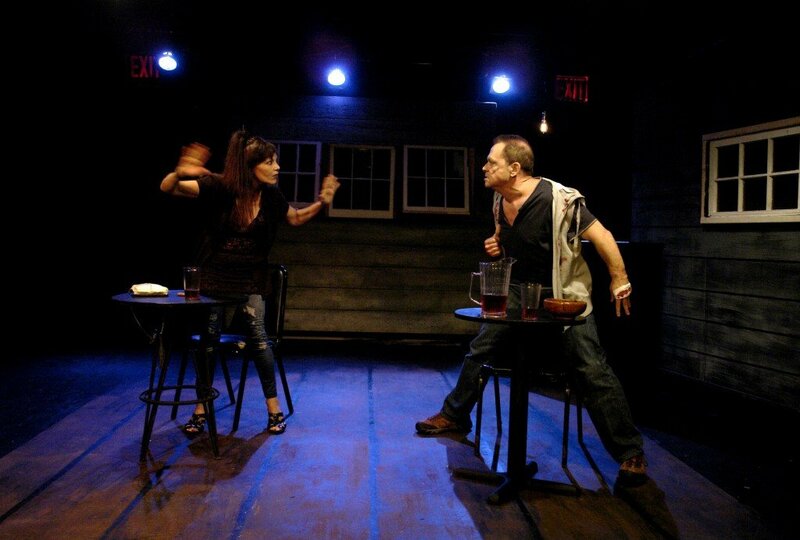 Two very broken people meet in a desolate bar, tough-guy Danny, who thinks he may have killed a man last night, and Roberta, driven by shame to the edge of crazy despair. Roberta, morphing from flirtatious to hysterical (the shifts done superbly by Susan Mitchell) tries to allure Danny who turns near murderous on the dime at any approach (a violently scary John Talerico). He resists, she persists. Feeling she has nothing to lose, she taunts this savage bear of a man, grabs him by the shirt, faces him down … you’re sure he’s going to smack her, maybe kill her, while she swims between doesn’t care if he does and asking for it. But Danny holds back – he doesn’t kill her and she reveals to him her shameful secret. In their gorgeously controlled dance of coming together, brutish, heavily muscled Danny plays off against fragile, delicate Roberta. The physical presence of the two actors matches the emotional play of bold physical action and exquisite emotional nuance, the essence of the play. Shanley subtitles this play “An Apache Dance,” referring to the French tango-like street-life dance of the early twentieth century, “La Danse Apache”* (Apache pronounced ah-pahsh), in which the physical and emotional contrasts between male and female are emphasized, and with stylized violence, the men slap and punch their partners and throw them around, though the physicality of this play doesn’t seem stylized but real in the sense of American naturalist drama (Actors Studio variant). Danny swells with red-faced rage at anyone “wanting anything from him.” Still, Roberta, downbeat, coarse, but also with girlish charm and delicate loveliness, prevails on him to come to her room, where there they play out the familiar advances and retreats of love, all heightened by their extreme temperaments. There’s a wedding doll on her table, remnant of her wrecked first marriage and, almost unbelievably between these two, and during their night of love, the subject of marriage is raised. Will it survive the light of morning? Will he continue to protect her? Will she maintain her vision of a better life? Can these two deeply wounded human beings actually heal one another? How far can love take you? That question lies at the heart of Danny and the Deep Blue Sea. Witnessing Danny and Roberta pushing through toward an answer is dramatically compelling and suspenseful. It’s a small play, two actors, 80 minutes, and little sense of social forces or the outside world, but the play’s impact is breathtaking. The near to beyond-belief transition from instinct driven bullying to tender insight – and a really bright idea — would be hard to accept without as fine an actor as John Talerico in the role of Danny. I have never seen any actor do any part more magnificently than Susan Mitchell as Roberta. Mitchell played the role twenty years ago at New York City’s Stage 22 in a production also directed by Lissa Moira. Mitchell’s Roberta is physically delicate, enchantingly feminine, and hard as nails – almost too tough for the tough guy which is one of the delicious dramatic contrasts lacing this play. Her face, voice and expressions register splendid nuance. Watching her, many of the great female roles come to mind – I’d love to see her do them. Together these outstanding actors, working with Moira’s deeply understanding direction, create a world. I didn’t want to leave that world when it was over, and I’ll never forget it. Danny and the Deep Blue Sea plays in a little theater as off- off- Broadway as you can get and you can’t find better theater anywhere. Danny and the Deep Blue Sea is at Theater for the New City in Manhattan’s East Village through October 11, 2015. For tickets, visit smarttix.com or call 212-868-4444 or — easiest and without surcharges — just pick up your tickets at the box office when you go to see the play. * La Danse Apache has been incorporated into many plays and films about Paris and currently on Broadway can be seen as part of the inspiration for the great dancing in An American in Paris. Susan Mitchell and John Talerico. Photo Peter Welch. looked … found it … fixed! Thanks. Thank you for such a generous review. I appreciate it immensely! Indeed this was a thrilling dramatic experience. The two actors brought you into their reality and the playwright structured it so that you really did not know what to expect next. The end was the logical conclusion – but also how they switched their personae – she tender – he tough; then she tough and he tender; and then both tender. I thank the actors for a superb and totally memorable evening.